Your inner history buff will appreciate 9/11 Memorial and St. Patrick's Cathedral. There's still lots to do: take in the pleasant sights at Central Park, admire the landmark architecture of Rockefeller Center, make a trip to Empire State Building, and explore the world behind art at The Metropolitan Museum of Art. For traveler tips, photos, where to stay, and other tourist information, go to the New York City trip planner. Tel Aviv, Israel to New York City is an approximately 14.5-hour combination of flight and bus. You can also fly. Due to the time zone difference, you'll gain 7 hours traveling from Tel Aviv to New York City. Traveling from Tel Aviv in February, expect New York City to be colder, temps between 9°C and -1°C. Wrap up your sightseeing on the 18th (Mon) early enough to travel to Grand Canyon National Park. Take a break from the city and head to Grand Canyon South Rim and Bright Angel Trail. Next up on the itinerary: stroll through Rim Trail, make a trip to Grand Canyon Village, explore the stunning scenery at Inner Canyon, and take some stellar pictures from Pima Point. For where to stay, photos, traveler tips, and more tourist information, read our Grand Canyon National Park driving holiday app . Getting from New York City to Grand Canyon National Park by combination of bus and flight takes about 12.5 hours. Other options: do a combination of flight and bus; or drive. You'll gain 2 hours traveling from New York City to Grand Canyon National Park due to the time zone difference. Traveling from New York City in February, plan for a bit cooler nights in Grand Canyon National Park, with lows around -9°C. Wrap up your sightseeing on the 22nd (Fri) early enough to travel to Las Vegas. On the 23rd (Sat), take in breathtaking views at Red Rock Canyon National Conservation Area, try your luck at New York New York Casino, and then admire the local landmark of Bellagio Fountains. Here are some ideas for day two: see the interesting displays at The Mob Museum, then take in nature's colorful creations at Bellagio Conservatory & Botanical Gardens, and then shop like a local with The Strip. For where to stay, photos, traveler tips, and tourist information, go to the Las Vegas trip maker . Do a combination of flight and car from Grand Canyon National Park to Las Vegas in 4.5 hours. Alternatively, you can drive; or take a shuttle. Due to the time zone difference, you'll gain 1 hour traveling from Grand Canyon National Park to Las Vegas. Traveling from Grand Canyon National Park in February, expect nights in Las Vegas to be much warmer, around 8°C, while days are somewhat warmer, around 21°C. Cap off your sightseeing on the 24th (Sun) early enough to go by car to Yosemite National Park. Get in touch with nature at Yosemite Ski and Snowboard Area and Elizabeth Lake, Yosemite National Park. The adventure continues: hit the slopes at Curry Village Ice Rink, take in the awesome beauty at Cathedral Beach Picnic Area, get to know the fascinating history of Big Trees Lodge, National Historic Landmark, and take in the dramatic natural features at Glacier Point. 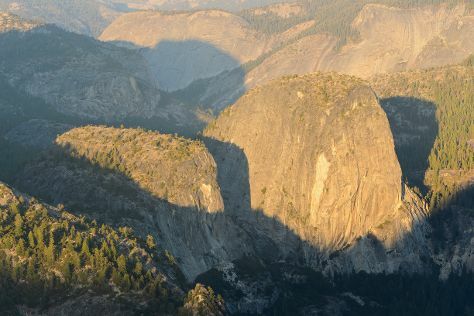 For traveler tips, reviews, and more tourist information, refer to the Yosemite National Park day trip planning site . Traveling by car from Las Vegas to Yosemite National Park takes 9 hours. Traveling from Las Vegas in February, expect nights in Yosemite National Park to be colder, around -9°C, while days are slightly colder, around 10°C. Wrap up your sightseeing on the 28th (Thu) to allow time to drive to San Francisco. Start off your visit on the 1st (Fri): steep yourself in history at SS Jeremiah O'Brien, take in the pleasant sights at Fisherman's Wharf, then step off the mainland to explore Alcatraz Island, and finally contemplate the long history of City Lights Booksellers. Get ready for a full day of sightseeing on the 2nd (Sat): take your sightseeing to a higher altitude at Twin Peaks, make a trip to Golden Gate Park, and then snap pictures at Golden Gate Bridge. To find more things to do, maps, and more tourist information, refer to the San Francisco trip planner . Traveling by car from Yosemite National Park to San Francisco takes 4 hours. Alternatively, you can do a combination of car and flight; or do a combination of bus and flight. Traveling from Yosemite National Park in February, expect nights in San Francisco to be much hotter, around 10°C, while days are somewhat warmer, around 19°C. Wrap up your sightseeing on the 2nd (Sat) to allow time to travel back home.